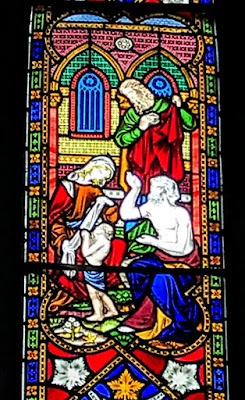 One afternoon last week, before a meeting in Limerick, I had an opportunity to visit Saint Michael’s Church, Limerick, and to photograph the windows made by Mayer & Co of Munich in 1878 and Heaton, Butler and Bayne of London. Then late this week, between an afternoon meeting in Rathkeale and an evening meeting in Adare, I found time to visit Saint Nicholas’s Church, the Church of Ireland parish church in Adare, Co Limerick. 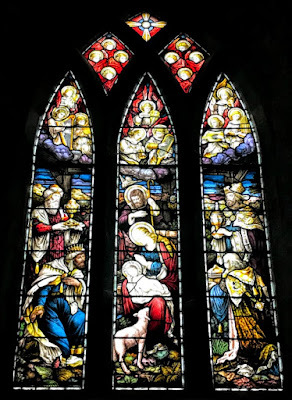 I have visited this church on many occasions in past, including preaching there at the Harvest Thanksgiving Service last year , although I have yet to write about the church, and until this week I had not attended to the details in the stained-glass windows. 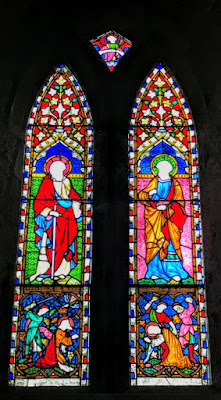 As I photographed the windows in the church, I also realised I had returned to the Pugin trail, seeking to identify the buildings in Ireland associated with AWN Pugin (1812-1852) and the Gothic revival in church architecture in the mid-19th century. 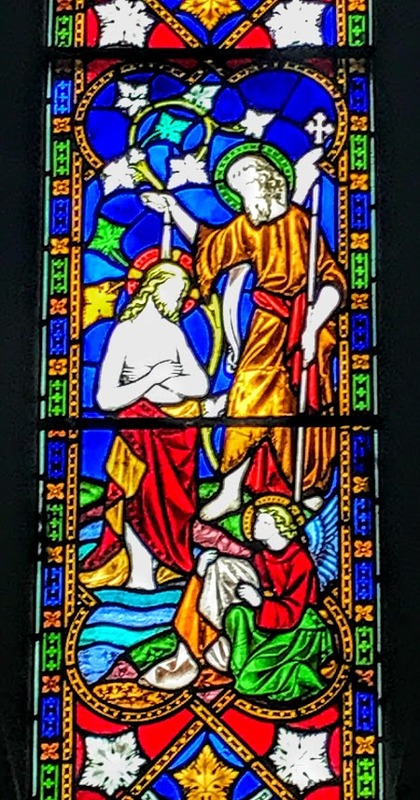 Saint Nicholas’s has a splendid collection of windows by the studios of Mayer & Co in Munich, by Heaton, Butler and Bayne, and by the Birmingham studios of John Hardman. 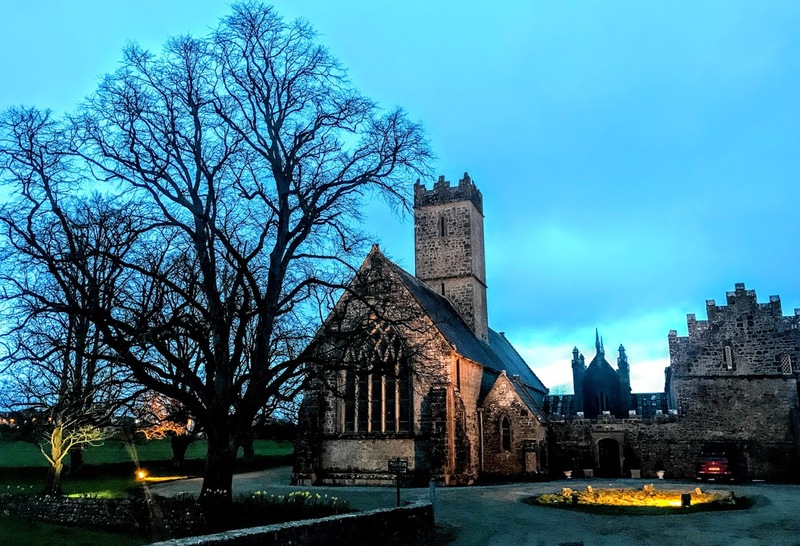 All three companies were closely identified with the Gothic Revival, and to find works from all three studios in one church in an Irish town is a real delight. 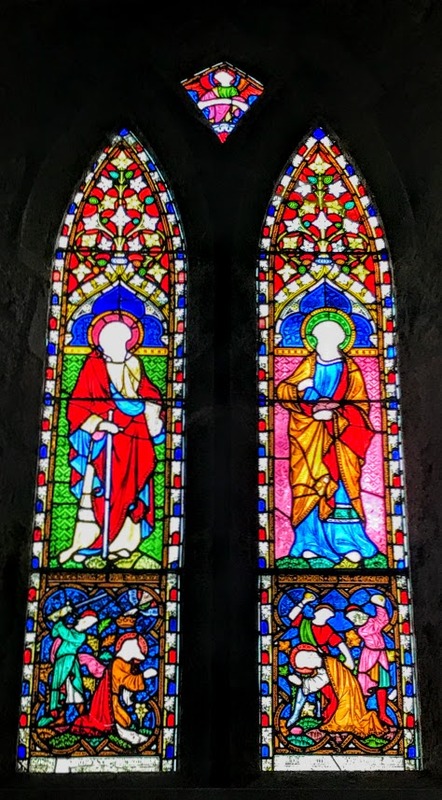 Four sets of windows in Saint Nicholas’s, Adare, are the work of Joseph Hardman’s studios in Birmingham and their principal designer, John Hardman Powell: the East Window in the Chancel; the window on the south wall of the chancel, above the altar rails; the main window at the East end of the South Aisle; and the window at the back of the church at the west end of the Nave. 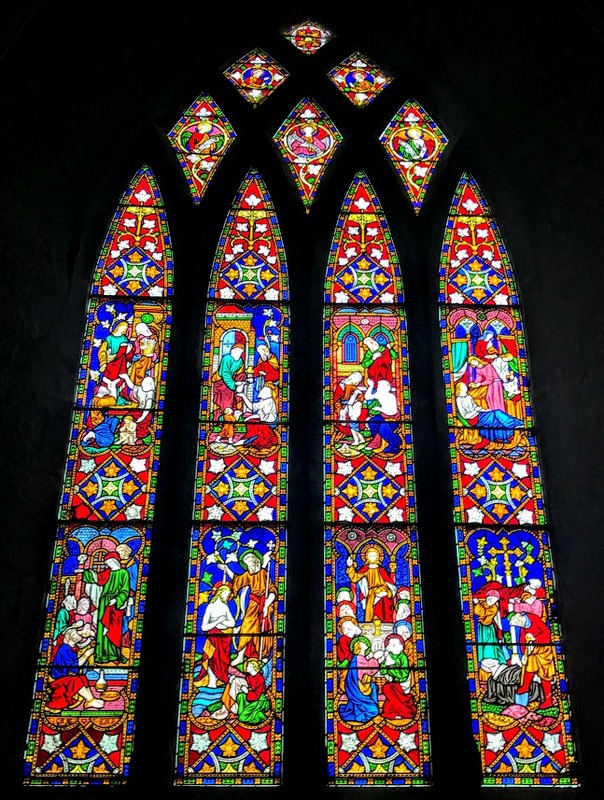 These four windows, taken together, are a unique collection and provide a direct link between Adare and the work of Pugin. The Hardman studio was founded in 1838, began manufacturing stained glass in 1844, and was one of the leading manufacturers of stained glass and ecclesiastical fittings until it was wound up in 2008. The three key figures in the business were John Hardman snr (1766-1844), of Handsworth, then in Staffordshire, who was the head of a family business designing and manufacturing metalwork, his son John Hardman jnr (1812-1867), and his nephew John Hardman Powell (1827-1895). The Hardman family and studio were closely associated with AWN Pugin from the 1830s, when he was commissioned by the Bishop Thomas Walsh to design Birmingham Cathedral as a suitable church to house the relics of Saint Chad, which had been rescued from destruction at Lichfield Cathedral during the Reformation. When Pugin’s building was consecrated in 1841 as Saint Chad’s Cathedral, it was the first Roman Catholic cathedral built in England since the Reformation. Pugin contracted Hardmans to provide metalwork for Saint Chad’s Cathedral, and the Hardmans were enthusiastic donors, giving the rood screen to the cathedral and providing the Hardman Chantry in which John Hardman sr was buried in 1844, followed by later family members. 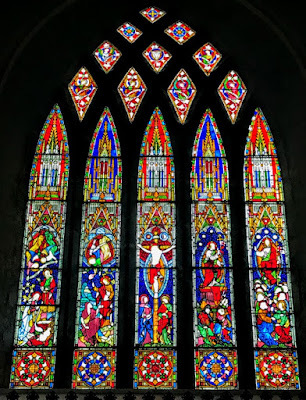 From 1845, at Pugin’s urging, his close friend John Hardman jr entered the fast-developing stained-glass industry. He was joined by his nephew, John Hardman Powell, who became Pugin’s son-in-law and claimed to have been Pugin’s only pupil. 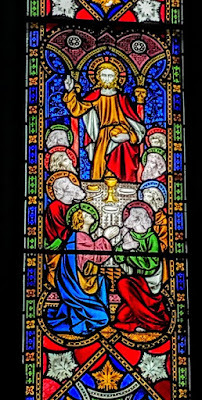 As a young man, John Hardman Powell stayed at The Grange in Ramsgate to assist Pugin with his many orders for stained glass, church plate, and other artefacts. Through Pugin, the firm became very successful throughout the 19th century and set high standards of design and craftsmanship, initiated by Pugin and then developed by Powell, who married Pugin’s first child, his daughter Anne, in 1850. Pugin supplied the first designs for Hardmans, and in his later years relied increasingly on his talented son-in-law Powell to provide the designs for stained glass. Powell became the chief designer for Hardman’s after 1849 and before Pugin’s death in 1852. The company also took part in the Great Exhibition of 1851 in London, exhibiting the great chandelier designed for Alton Towers in Staffordshire. A year later, Hardman and Powell collaborated with AWN Pugin’s son, Edward Welby Pugin, in designing the funeral arrangements of John Talbot, 16th Earl of Shrewsbury, in November 1852. Pugin’s involvement in Irish church building and decoration gave rise to the establishment of an Irish branch of the firm in Grafton Street, Dublin, in 1853, under the direction of Thomas Earley and JH Powell’s brother, Henry Powell (1835-1882), who lived at 25 Elm Grove, Ranelagh. 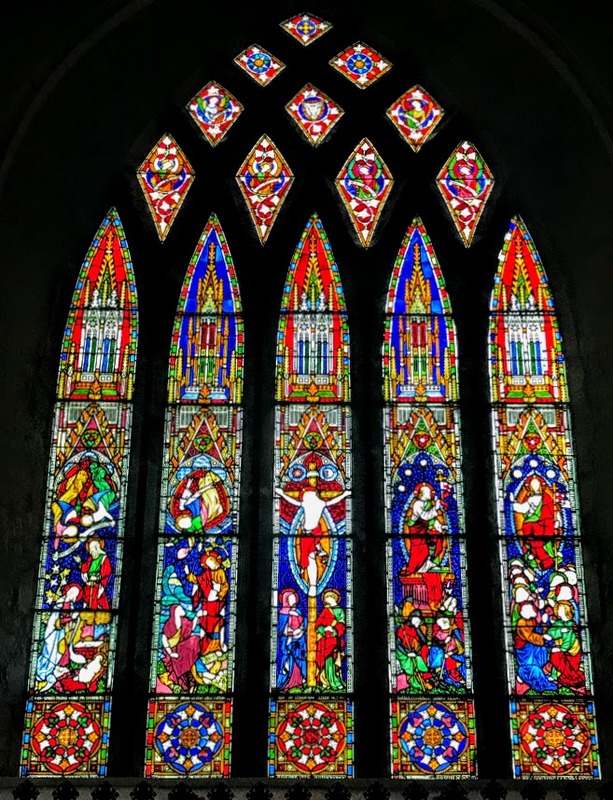 Under JH Powell’s direction, the firm produced enormous amounts of stained glass for Anglican and Roman Catholic churches throughout Britain and Ireland, and beyond, in the second half of the 19th century. Powell never forgot his debt to Pugin, saying he had learned everything from him. But he gradually evolved a personal style, involving rather more elongated figures and a more exaggerated sense of movement than his master. He also wrote a vivid and affectionate memoir of his great teacher, Pugin in his Home (1889). The collaboration between the Hardmans and the Pugins continued after Edward Welby Pugin’s death in 1875 with the later firm, Pugin & Pugin. This collaboration lasted for three generations and was a major influence on church architecture and decoration and the Gothic Revival. Under JH Powell, the metalwork design department split from the stained-glass department in 1883 and traded under the name Hardman, Powell and Co. Powell died in 1895, and the leadership of the firm passed to John Bernard Hardman, a grandson of John Hardman snr. A large proportion of the Hardman archive was damaged and destroyed in a fire in 1970. Some of the earliest cartoons are now held in Birmingham Museum and Art Gallery. The business closed in 2008. Powell’s designs are original innovations in the Gothic style. 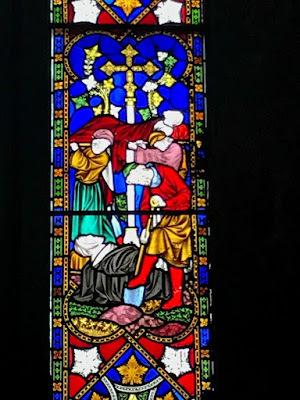 His stained glass recreates the elegance, the refinement, the brevity that is seen in some of the finest examples of glass, sculpture and illumination of the 13th and 14th centuries. He utilises the flowing, curving lines, the flourish of drapery, the calligraphic brush-strokes and pure colour. 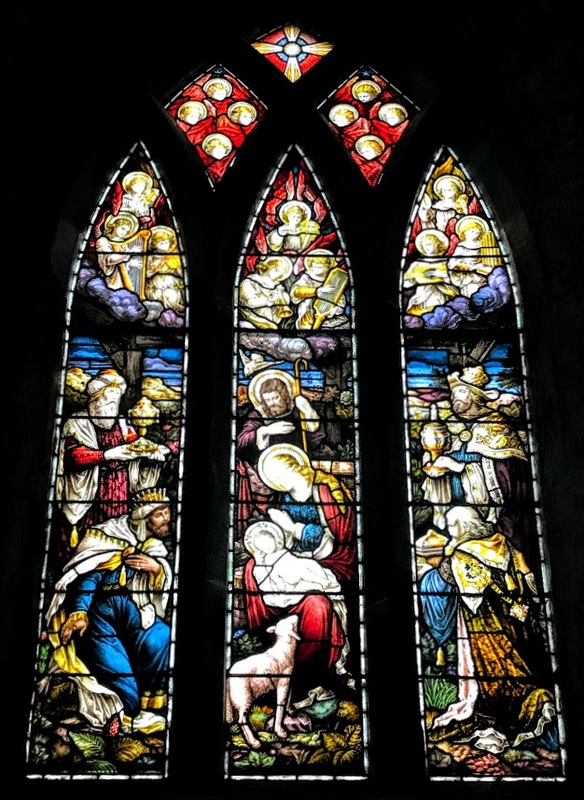 One of his best works is the large Immaculate Conception window in the north transept of Pugin’s Saint Chad’s Cathedral, in Birmingham, designed in 1868 in memory of John Hardman jnr. This is an elaborate and uplifting design, with a beautiful ethereal quality, pure colours, and a silvery overall light. Pugin was involved partly in the design of Adare manor, and in 1846 he produced designs for the hall ceiling, the great staircase, the gallery at the end of hall, the fireplace and doors for the 2nd Earl of Dunraven. 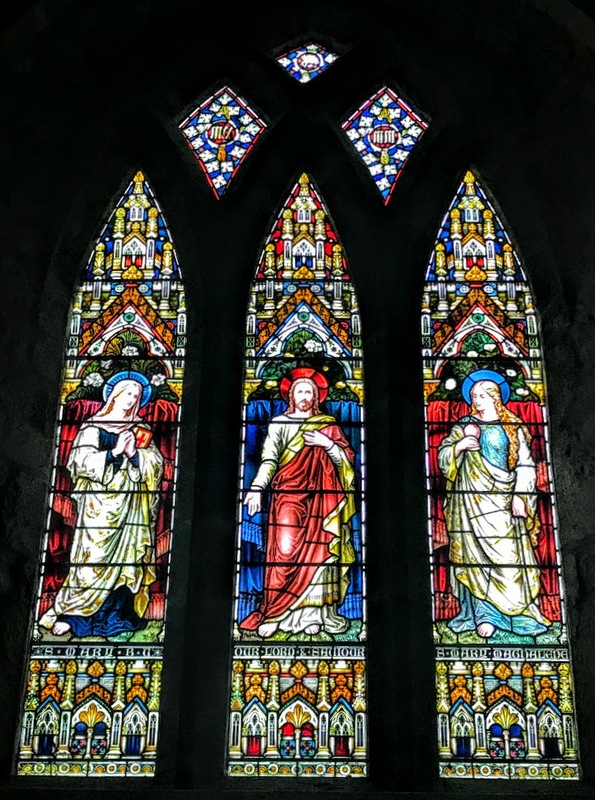 Phoebe Stanton says Pugin ‘added a new roof and stained-glass windows to the village church [in Adare], which he probably also totally restored’ Roderick O’Donnell, on the other hand, says Pugin did this work in for Roman Catholic Church in Adare, the former Trinitarian Abbey. 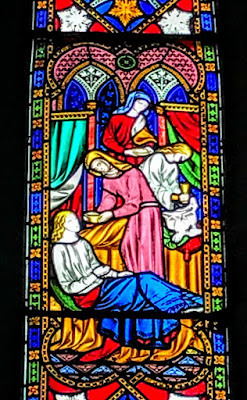 The involvement of Powell and the Hardman studios in windows throughout Saint Nicholas’s seems to confirm Phoebe Stanton’s choice of this church, although there is extensive evidence of Pugin’s influence throughout the Trinitarian Abbey too. 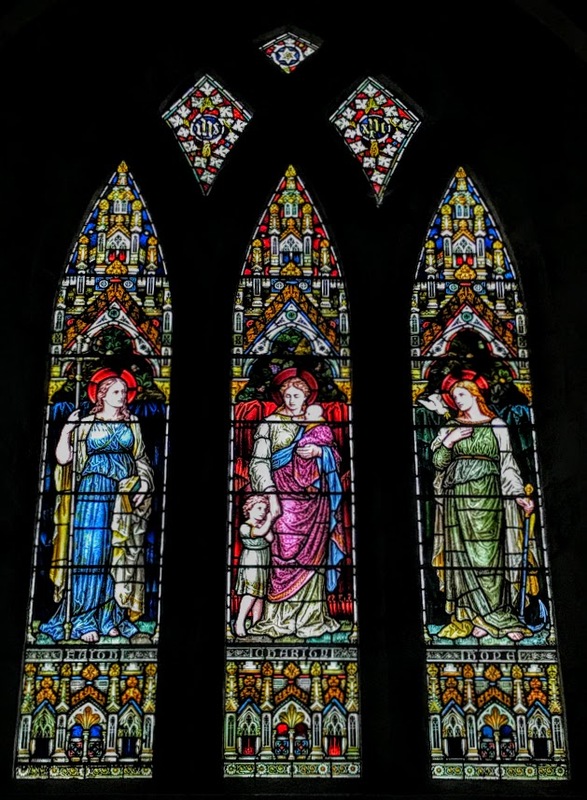 The East Window in the Chancel in Saint Nicholas’s Church was designed by Powell in the Hardman studios in Birmingham and dates from 1850. 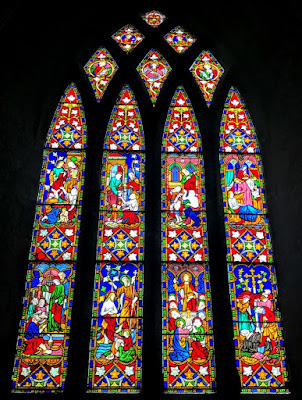 This window consists of five lancets, measuring 4760 x 600, with ten intersecting tracery lights. 5, the Ascension (first from right). The window on the south wall of the chancel, above the altar rails, consists of two lancets, measuring 2700 x 620, with one tracery light. This was designed by Powell in the Hardman studios ca 1855, and the man images are of Saint Paul and Saint Barnabas. 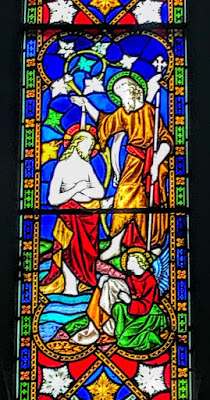 The predella below Saint Paul depicts the beheading of Saint Paul, while the predella beneath Saint Barnabas depicts the stoning of Saint Barnabas. The main window at the East end of the South Aisle complements Hardman’s main East Window in the Chancel. 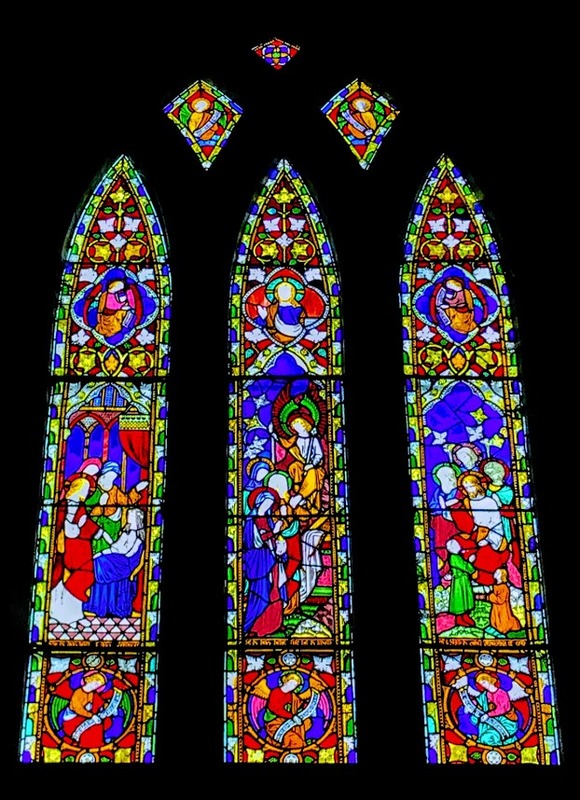 This window was also designed by Powell in the Hardman studios in Birmingham ca 1855. It is made of four lancets, measuring 3760 x 480, and six intersecting tracery lights. There are two rows of four scenes, illustrating eight Gospel themes in all. 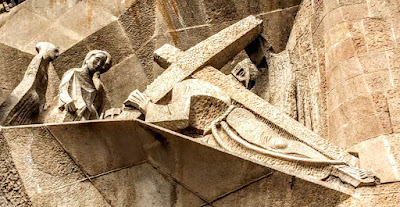 They point to six of the seven corporal works of mercy, and to the two principal sacraments of Baptism and the Eucharist. Until the Middle Ages, the corporal works of mercy were counted as six, until the burial of the dead was added to popular lists. However, the corporal work of mercy missing from Powell’s depiction is that of giving shelter to the homeless. 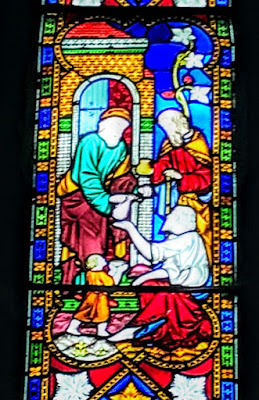 But when we remember the role of the Gothic revival in the Anglo-Catholic and Catholic revivals of the md-19th century, it is possible to deduce that in this window Powell is stating that the Church, expressed in its sacramental life, is our true home and that all should find shelter and refuge here. 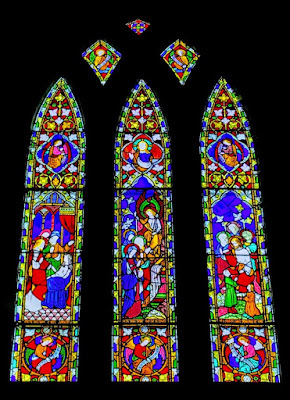 The window at the back of the church, high in the west end of the Nave, is composed of three lancets and three intersecting tracery lights. This too was designed by Powell in the Hardman studios in Birmingham. 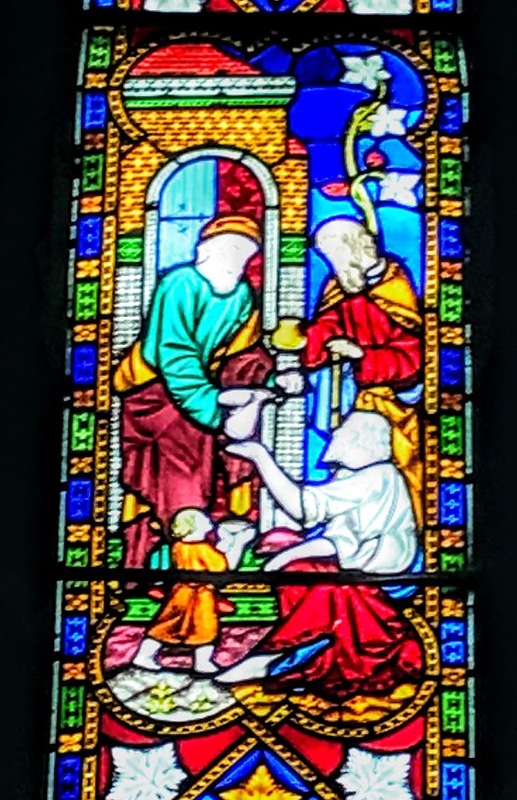 1, Christ raises the daughter of Jairus. 2, An angel greets the women at the empty tomb on Easter morning. 3, Christ blesses the children. 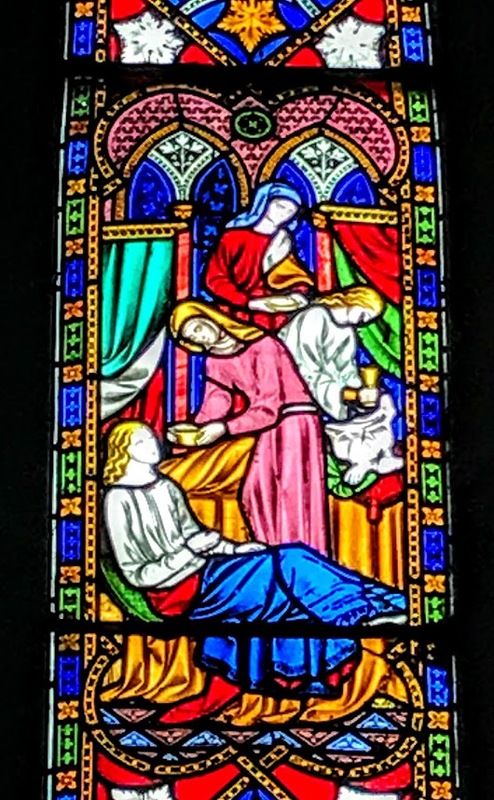 The first Mayer window on the left (looking from altar) depicts the Risen Christ in the centre, with Mary of Bethany to the viewer’s left and Mary Magdalene to the viewer’s right. The second Mayer window on the left (looking from altar) depicts the three virtues (from left): Faith, Charity and Hope. 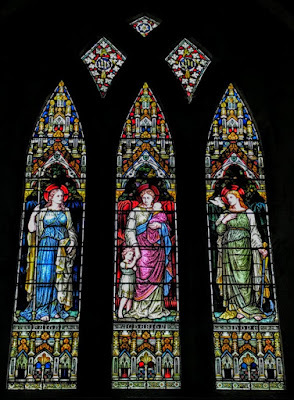 Saint Nicholas’s Church also has one window, in the south wall of the south aisle, designed in 1891 in the London studios of Heaton, Butler and Bayne. This window, depicting the Adoration of the Magi, is composed of three lancets, measuring 2700 x 480, and three intersecting tracery lights. 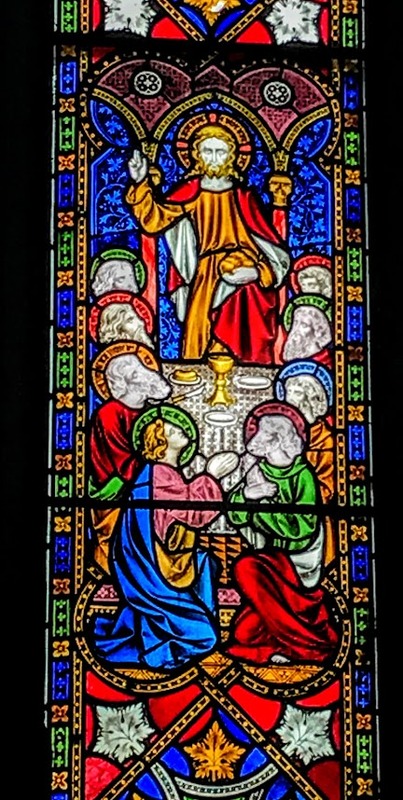 Many of the other windows in the church and in the church porch are plain, with clear glass, leaded and without decoration. Perhaps there was a vision for more windows from these studios; or, perhaps, the Dunraven family of Adare Manor ran out of enthusiasm for completing the decoration of the church initiated in the restoration works of the 1840s and 1850s.